We are so lucky in the Herald and News area to be served by so many great facilities on our wonderful river – none more so than Desborough Sailing Club in Shepperton. WE are so lucky in the Herald & News area to be served by so many great facilities on our wonderful river – none more so than Desborough Sailing Club in Shepperton. It’s a real family-orientated club, which currently has around 270 members, and in addition to organising handicap races in more than half a dozen different classes of dinghy, Desborough also has a very active fleet of cruisers. 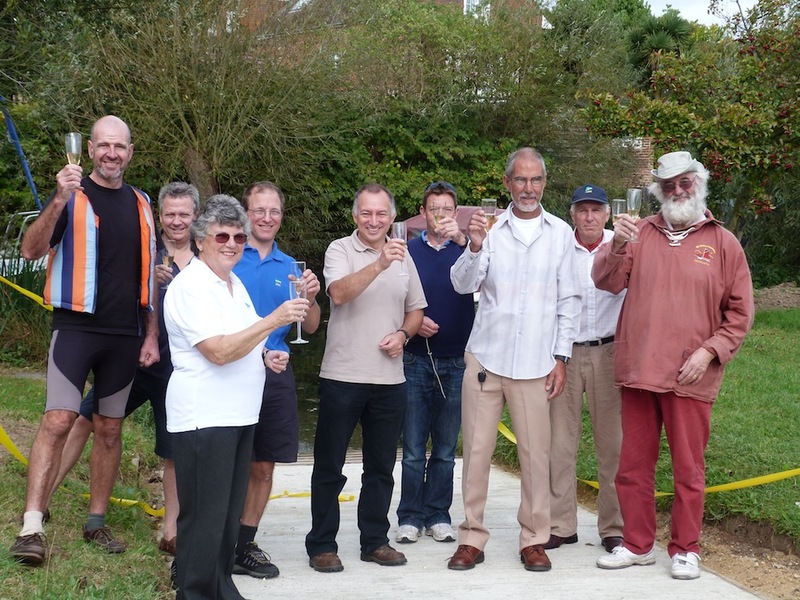 Just last week, the club celebrated the opening of a new cruiser slipway – designed and built by the members themselves – at the amazing cost of just £540. Club member Ross Archer, who sails his own Devon Lugger from Desborough, came up with the plan after discovering that the old slipway was providing him with no traction when he tried to pull his boat out of the water on its trailer. “The wheels of the car were just spinning,” he told me, “so I came up with this plan for replacing the old slipway which had been in use for upwards of 30 years. Watching the racing from the picturesque balcony of the clubhouse, I quickly understood why members love sailing from Desborough. The club is situated on one of the bends of the river as it rounds Desborough Island (just behind Church Square, Shepperton) which means there can be some really challenging conditions that test the skills of the most experienced sailors. And Sally is proud that the club keeps the sailing going virtually the whole year round unlike many other clubs on the Thames. Membership for a single adult costs £139 a year, with spouses charged just another £26. There are also good deals available for youngsters and social non-sailing members. And the club is also renowned for its social side holding band nights, a classic bonfire night party and numerous other events throughout the year. There’s a well-stocked bar which also serves snacks on race days. They also try to cater for those less able-bodied and Sally regaled me with the story of one young lady from the Sailability group (for disabled sailors) who went out on one of the Desborough boats with an instructor. For more information about Desborough Sailing Club, visit their website at www.desboroughsc.org. Better still, pop down there one weekend and see for yourself – just don’t blame me if you get hooked by this amiable group.